Water exploration by Arafura Resources – “a small company with a very large Chinese investor” – has identified a number of “highly productive” groundwater basins stretching from Aileron on the Stuart Highway all the way to the West Australian border. Right: Borefield drilling, 2013. Source: Arafura Resources. The company, working towards mining rare earths at Nolan Bore (approvals expected in the latter half of 2016), spent $2m on delineating the aquifers, now known as the Southern Basins. Local groundwater specialist Graham Ride assisted with the exploration. Arafura’s $2m equates to almost the total ($2.4m) allocated in the 2014 Northern Territory Budget for water exploration across nine regions over four years, in what appears to be a half-hearted attempt to find land suitable for agricultural production. 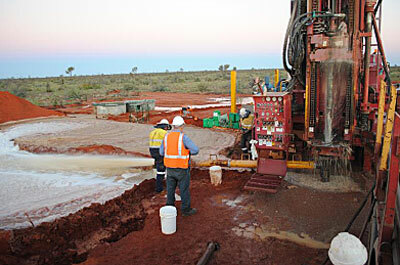 The Nolans Rare Earths Project is sited near the Aileron Roadhouse, 135 kms north of Alice on the Stuart Highway. Arafura says some locals were adamant that there was no groundwater in the region, but aerial surveys pointed to the presence of a paleochannel (an old river) beneath sections of Aileron and Napperby Stations south of the Reynolds Range. The new borefields were a “pleasant surprise” for the pastoralists, says the company, as they can now extend their operations onto previously unusable parts of their leases. “Water-stressed communities” such as Alyuen, Aileron Homestead and the Aileron roadhouse now have good reliable water supplies thanks to the discovery and subsequent work by the Central Desert Regional Council, according to the company. The community of Laramba, north-west of the mine site, raised concern about impacts of the activity on their water supply. Arafura says it is confident there won’t be any adverse impact. The project’s bores are deeper than the aquifer near Day Creek that supplies piped water to Laramba and Napperby Station. Above: A cross-section along Day Creek shows the different levels of the Laramba (shallow) and Nolans (deep) water supplies. The map at left shows the main Nolans Borefield (labelled). The black line indicates the cross-section ; the blue and purple areas shows the presence of deep groundwater aquifers. Source: Arafura Resources. In a presentation to the Alice Springs Town Council Arafura’s General Manager Northern Territory & Sustainability, Brian Fowler, said their modelling suggests that [ED – explanation modified, 28.4.16] water levels in the aquifer from which Laramba draws its water will drop by between .5m and 1m over 100 years as a result of the mining activity. However, this shouldn’t affect supply as the community’s bore draws water from deeper in the aquifer than the potential draw down. Rare earths are used in the automotive industry (in magnet-driven electric motors), clean energy technology and electronic sectors (providing the colour in smart phone screens, for instance), with global demand predicted to grow by 5% a year for the next 10 years. Extracting rare earths from the mined ore is done by acid leaching and the product then needs to be neutralised by washing and re-washing. This as well as other water uses will see Arafura pumping some 4000 ML out of the basins annually. Mr Fowler says the draw down in the mine’s main borefield (on the western part of Aileron and eastern part of Napperby) will be about 5m over 100 years. Mr Fowler (left, Cr Steve Brown in the background) promoted the mine to the council as having significant benefits for the town. Of a total $1.19B capital expenditure, $145M is expected to be spent in the NT, and $71M in Alice. Mine life is expected to be around 40 years and it will employ some 250 to 300 people in its operations (400-500 during the construction phase). However, only 30% of the jobs are expected to be filled locally. The barrier does not seem to be so much one of skills but of being “available to work”. Mr Fowler said their research into the local labour market indicated that a lot of people are “disengaged”. However, given the long life of the mine, this could change over time. Mr Fowler said he would be interested in talking to school students about their future prospects with the project. It would be “good business” to draw personnel from the local population. And to this end, the company will be offering inducements to fly-in fly-out (FIFO) workers to relocate to Alice Springs. The town will be a transport hub for the project, with FIFO workers coming through the Alice Springs airport, and rare earth products being trucked to town before being back-loaded onto trains returning to Darwin, from where they will be exported for further refinement. Hazardous materials (sulfuric acid, hydrochloric acid, caustic soda, soda ash and diesel) will also be trucked to and from the site. Transport issues are two of the four risks associated with the project that are assesed as high, out of 180 assessed issues. While everything will be done to mitigate risk it cannot be eliminated entirely. 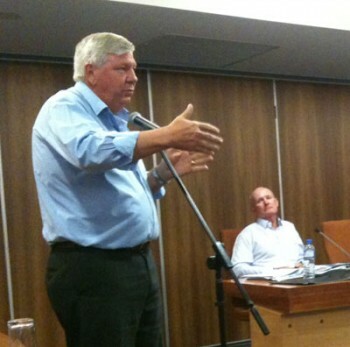 The consequences of a transport accident would be significant, said Mr Fowler. Their road trains would of course be using the open speed section of the Stuart Highway, however a spokesperson for Arafura says the company does not have a view on the issue of the open speed limit. Their vehicles will not drive at night and heavy vehicles will comply with the speed regulations specific to them. Waste from the project will be managed in a way that “reduces the likelihood of pollution or legacy issues”. The company will provide a security bond to the NT Government to cover estimated rehabilitation costs. Are there any more quantifiable details available about this groundwater basin? The volume of groundwater in storage in the Mereenie AS in the Roe Creek area with a TDS of less than 1000 mg/l was last estimated to be between 750 to 1060 GL. How vast and how good is this new water supply?